Can artificial intelligence enhance human detection of bone disease? Myeloma is a disease that affects the skeleton and can be difficult to pick up at an early stage because symptoms are often quite vague. People who suffer from myeloma may be generally more tired than usual due to anaemia and may have aching bones. As the disease progresses, thinning of the bones may result in fractures, particularly of the spine, and this may be the first time that the diagnosis is picked up. The kidneys may also be affected due to an increase in myeloma proteins circulating in the bloodstream getting caught up in the delicate kidney tubules that filter the blood. If the disease is picked up early, some of these problems can be prevented. The diagnosis can be made by a blood test that looks for these myeloma proteins. If myeloma is suspected on the blood test, a special scan called “whole-body MRI” (WB-MRI) is recommended by NICE to show which parts of the skeleton are affected by the disease. These scans are very specialised and need quite a lot of training and experience to understand, and it can take some time for the radiologist to read the scan which has over a thousand images. This is tough for radiology departments, as there are not enough radiologists to keep up with standard NHS work, let alone getting to grips with WB-MRI scans! Even for experienced readers, myeloma can be difficult to spot when there are only a few tiny sites of disease. In the case of advanced disease, dozens of sites of disease can overwhelm the human reader, with too many sites to measure and record. 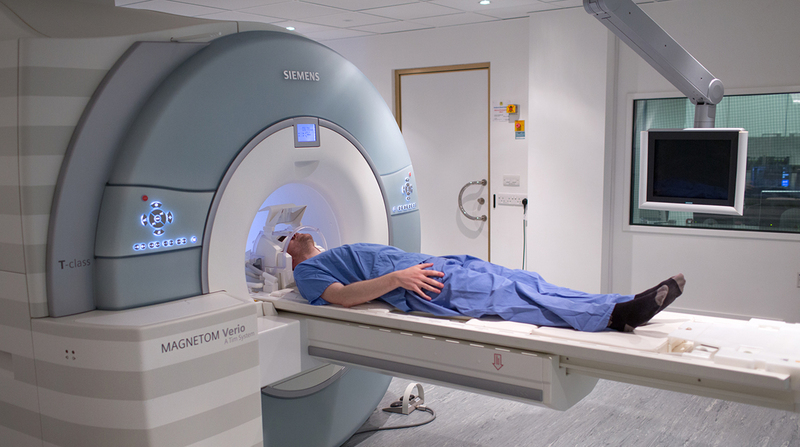 As a result, only some NHS hospitals offer the state-of-the-art WB-MRI scan. Left is a chest x-ray and right is the same patient’s WB- MRI just showing the chest part. Many sites of disease are seen on WB-MRI as black dots, whereas the CXR looks normal. Images courtesy of Dr Christina Messiou, RMH. I have been working with a team to train artificial intelligence (AI) tools to recognise other types of cancer on WB-MRI and it seemed that myeloma might be an important new challenge. What our team is trying to find out is whether AI can be used to help radiologists read the WB-MRI scans of patients with myeloma. We hope that AI might detect the disease as well as reduce the time needed for the radiologist to review the entire scan. This might allow WB-MRI to become a test that can be readily offered to myeloma patients throughout the NHS. It sounds like a great idea, at least to me! But how can we make this vision a reality? Is it an impossible task? Where do we even start? Well, we call it the MALIMAR study (Machine Learning in MyelomA Response). 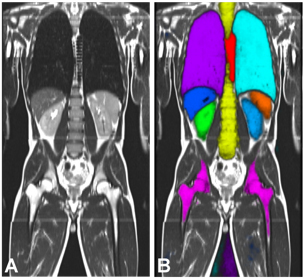 Whole body MRI in healthy volunteer from the NIHR funded MALIBO study (Machine learning in body oncology). Image A is without the machine learning and B is with machine learning which has been trained to detect healthy organs. Step number one is to gather together a large set of WB-MRI scans in patients with definite myeloma that have already been reported by complete experts in the field (in this case, my colleagues Drs Christina Messiou, Nina Tunariu and Prof Mu Koh at the Royal Marsden Hospital). We also need a set of WB-MRI scans from healthy volunteers that do not have myeloma. Step number two is to find the best computer scientists around who will use these scans to train a computer algorithm to recognise the difference between a healthy skeleton and a patient with myeloma. It’s a bit like teaching an algorithm to recognise the difference between pictures of cats and dogs – but obviously on a much more serious level. Dr Ben Glocker and his computer wizards at Imperial’s Department of Computing absolutely fit the bill when it comes to the task of training a computer algorithm using convolution neural networks. Step number three is to test how well “human” radiologists can read WB-MRI scans using the AI support tool compared to their “human-only” read – to see if it actually helps! We have a fantastic team of radiographers, radiologists, data scientists, statisticians, trial manager, MRI physicists (and me, a clinical radiologist interested in AI). We’re so excited about MALIMAR and the timing couldn’t be better, as the study opens on the 70th birthday of the NHS. We are thrilled that the NIHR have funded the study, with the support of Myeloma UK, The Royal Marsden Hospital, Imperial College London and The Institute of Cancer Research. Collaboration is the key, in order to bring all the best players together for the benefit of patients! Our previous experience tells us that we need to be braced for lots of challenges ahead and to be honest, we don’t even know what difficulties we might face along the way. Flexible, innovative thinking and lots of hard graft lie ahead. But finding a way for AI to enhance human radiology reads to detect myeloma is an exciting project to keep us all busy for the next few years. Professor Andrea Rockall is Clinical Chair of Radiology at Imperial’s Department of Surgery and Cancer and Honorary Consultant Radiologist at Imperial College Healthcare NHS Trust and The Royal Marsden NHS Foundation Trust. *More information on the MALIMAR study is available on the NIHR Journals Library website. **Professor Andrea Rockall’s co-investigator, Dr Christina Messiou from The Institute of Cancer Research and The Royal Marsden NHS Foundation, demonstrates the state-of-the-art technique and explains its potential impact for healthcare as part of an ITV News feature broadcast yesterday about using patient data and big data in research. It includes an interview with Professor Sir Peng Tee Khaw, Director, NIHR Moorfields Biomedical Research Centre as part of the NHS 70th birthday celebrations. Watch the broadcast online.